My last creation for Teissiere. An advergame designed and developped with Castor & Pollux. 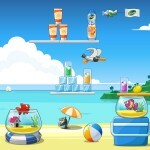 This is a Facebook application with contest. But the constest is over now. By the way this version is only a demo: Only 6 levels are available. Color is a little puzzle game with physic based gameplay. 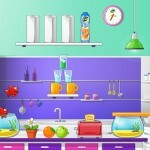 The player should solve puzzle with dexterity and ingenuity to pouring syrup into an aquarium.